Using a collaborative Wiki framework, the goal of reanalyses.org is to facilitate comparison between reanalysis and observational datasets. 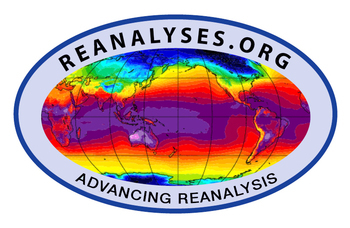 Evaluative content provided by reanalysis developers, observationalists, and users; and links to detailed data descriptions, data access methods, analysis and plotting tools, and dataset references are available. Discussions of the recovery of observations to improve reanalyses is also a focus. The wiki framework encourages scientific discussion between members of reanalyses.org and other reanalysis users. Sign up and see more content! Signing up for a login will allow you to see more content including land reanalysis and more content in each category. And you can add content to make this a better resource for others. Kalnay et al. (1996), The NCEP/NCAR 40-year Reanalysis Project, in 20 years since publication has been cited more than 26000 times, as determined from Google Scholar. CERA-20C: ECMWF has released their second reanalysis (and first coupled) of the 20th century. More details here. MERRA-2: NASA GMAO has just released a new version of the MERRA dataset spanning 1980 to present. More details here. 20CRv2c: NOAA and CIRES just released an improved version of the 20th Century Reanalysis, "2c", spanning 1851-2012, with experimental extension to 2014. More details here. JRA-55: The new Japanese 55-year Reanalysis (1958 to present) is available from multiple data providers. CHOR: CMCC just released their first historical ocean reanalyses of the 20th century. More details here. Last Millennium Reanalysis workshop 2-3 Oct 2017: Discuss the Last Millennium Reanalysis and paleoclimate data assimilation at its third workshop, to be held Oct 2-3 at the National Center for Atmospheric Research (Mesa Lab) in Boulder, CO. Attend a 1-day hackathon on October 4 to provide graduate students and early-career scientists with hands-on training to use the newly available data and code to perform experiments, work with the output, and analyze results. Limited travel support is available, with priority given to junior participants. Register at https://www.regonline.com/LMR. Address questions to Loretta Quinn at UCAR (lquinn@ucar.edu). Extratropical deep cyclones show an increase over the past half century. Discussion Page. Wang et al. (2016) paper. Surface Solar Radiation in North America from reanalyses and observations. Discussion Page. Slater (2016) Paper.